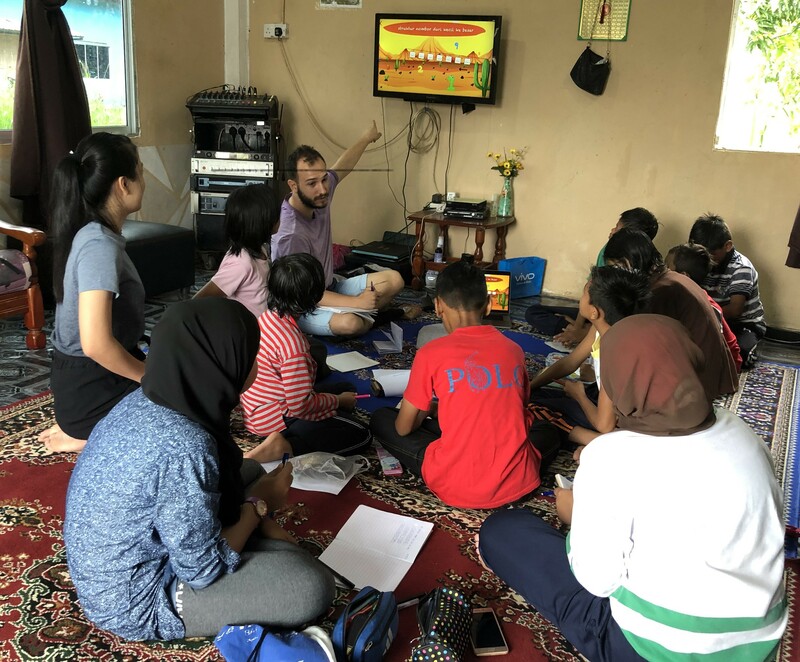 Blog by Aron van Groningen, master student Information Science at VU doing his master research field work in communities (kampungs) in Sarawak, Malaysia. Education is a big problem in rural areas of Sarawak. Last year I went with a group of students of the Vrije Universiteit Amsterdam to Sarawak (Malaysia) to do research about how we can improve the education in rural areas of Sarawak. During the project we created an application to learn English in a fun way. In the application we used comic books which the children liked to make them familiar with the English language. The children loved it to read about their favourite cartoon characters while they where learning English. Nevertheless, during this research we found out that the children have a lot of difficulties with mathematics. This is the reason, why I wanted to go back to Sarawak to help these children to learn mathematics. My idea is to use gamification, storytelling and learning methods of mathematics to let the children play a game while they where learning mathematics. After a long trip to Kuching, dr. Cheah (professor of UNIMAS) pick me up from the airport. It was time to explore the city and taste the amazing food of Malaysia. The most amazing part of Kuching is the waterfront by night. When it is night the government building is full of light and this looks amazing. Although, I could not stay for long because I needed to sleep early. The reason of this is that the next day Dr. Cheah arranged an meeting with the daugther of the chief of Pinggang Jaya village. She told me that the educational level in rural areas of Sarawak is not very good. Some of the children does not have any resources to learn. Furthermore, some children need to walk hours to their school along dangerous roads. Although they do have dumb phones and smartphones. Kids use them for example to play games and for social media. After the interview with the daughter of the chief several children were eager to meet me, because they have heard that I am going to create a game for them. And these children prefer to play games all day. I saw that immediately when I showed some interfaces of the game. Immediately all children wanted to play the game. During several tests with the children I tried to understand the educational system in Sarawak as well as their level of education. From these test came out that these kids are not very different than children in the Netherlands. They face the same problems the children in the Netherlands face as well as they have almost the same interests or hobbies. For example, girls love shopping and the boys love to play soccer. The next focus group session with the children was a couple days later. Dr. Cheah planned a second focus group with the children. During the first focus group I found out that it was difficult to communicate with the children, because I cannot speak Malay and they do not speak English. However, I tried to learn some Malay to tell my story what I wanted to do during the focus group. This was very funny, because it felt like these kids were teaching me instead of the other way around. During the focus group session with the children, I tested several mathematical learning methods from the Netherlands. The result were interesting. Mathematics in Sarawak is a lot different in primary schools than in the Netherlands. You will think that math is just only about numbers. However, in the Netherlands the teachers are focusing on visualising the exercises with a lot of images and explanation when the kids learn something new. In contrast to that, the material of mathematics in Sarawak is presented more formal with only numbers and a little explanation. The days fly by! But I am excited for the coming weeks and hope that I can create something that the children will love!